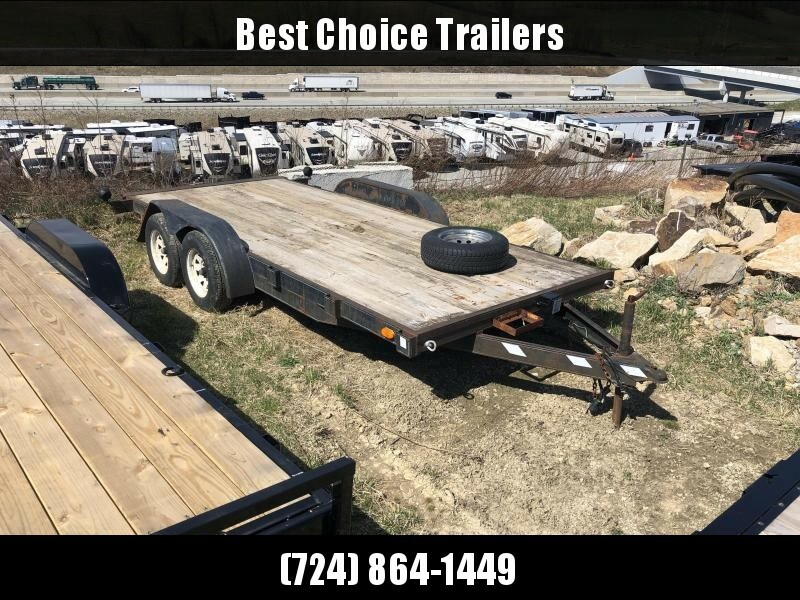 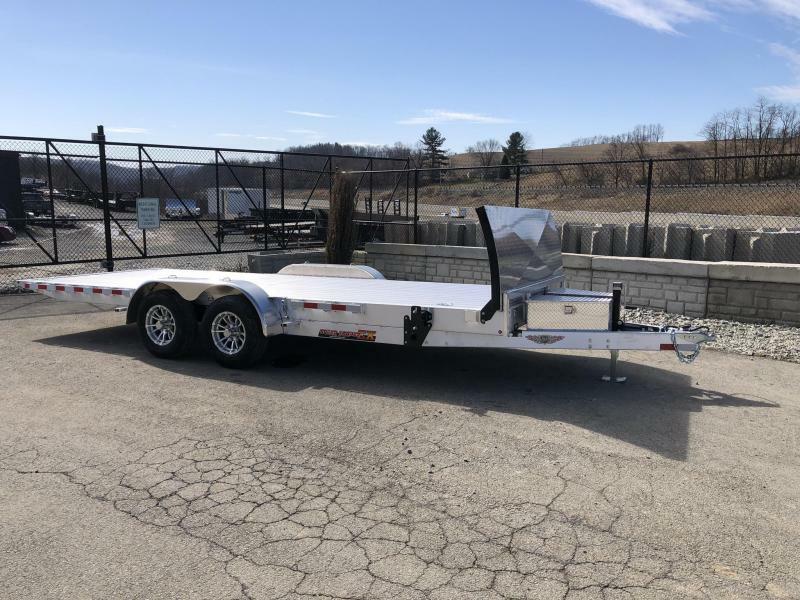 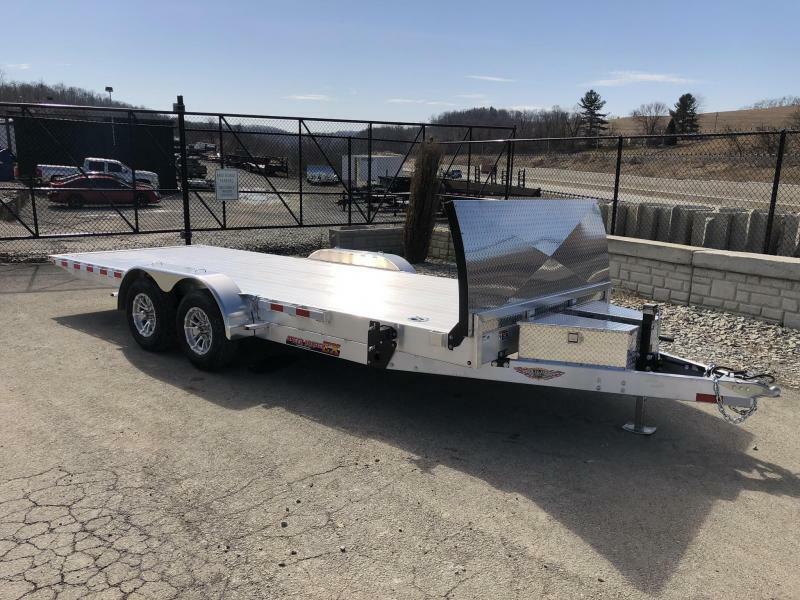 THIS TRAILER IS EQUIPPED NEW DUAL TOOLBOXES, TORSION SUSPENSION, EXTRUDED FLOOR, FRONT ROCK GUARD, 4 SWIVEL D-RINGS, SPARE TIRE & MOUNT, WINCH PLATE, WIRELESS REMOTE, AND EXTRA STAKE POCKET UPGRADES. 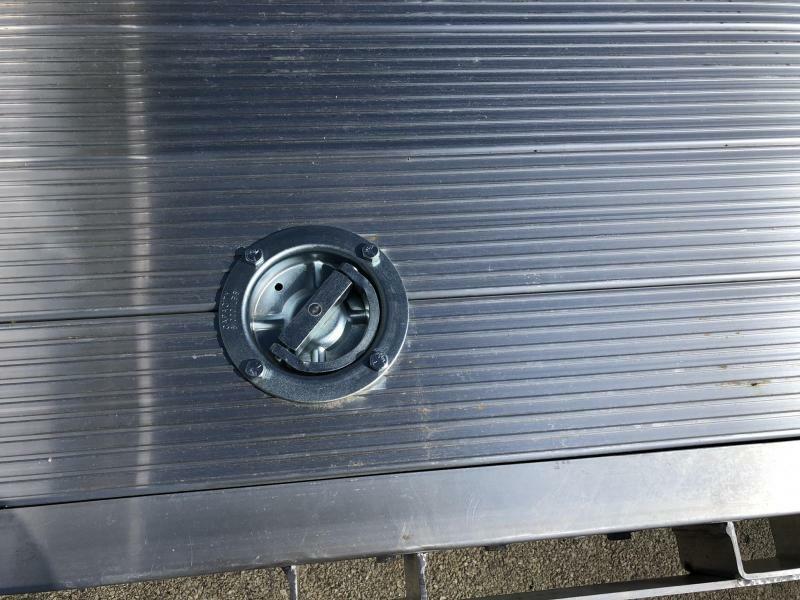 IT ALSO HAS A 12K JACK & ADJUSTABLE COUPLER UPGRADES (NOT SHOWN). 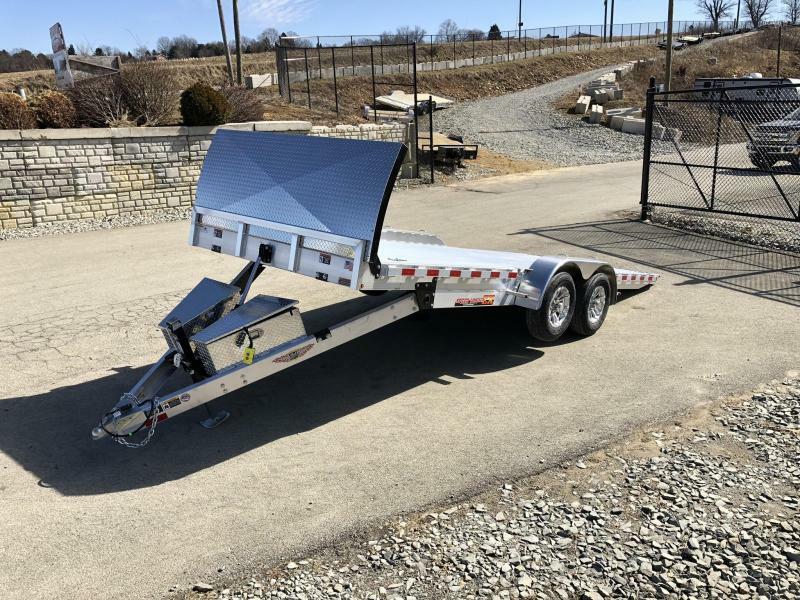 THE 14K MODEL ALSO INCLUDES 4" CHANNEL CROSSMEMBERS AND 8" FRAME UPGRADE. 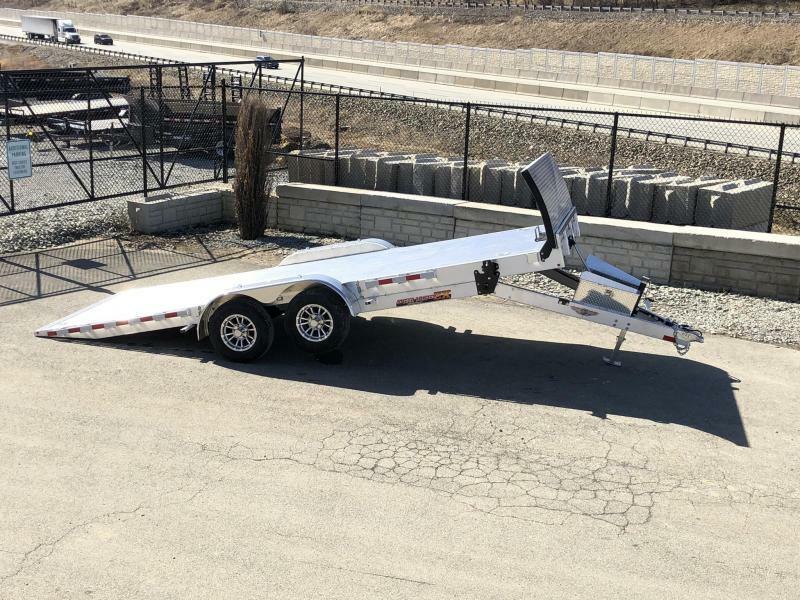 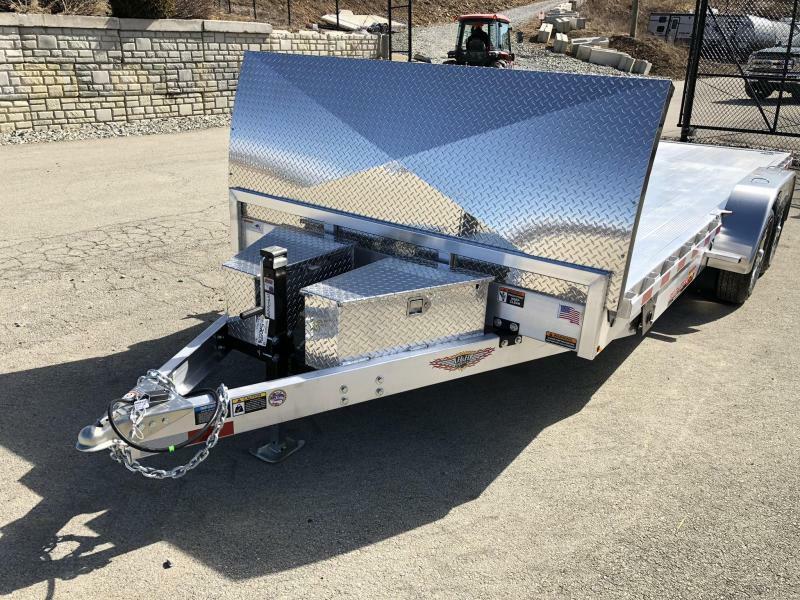 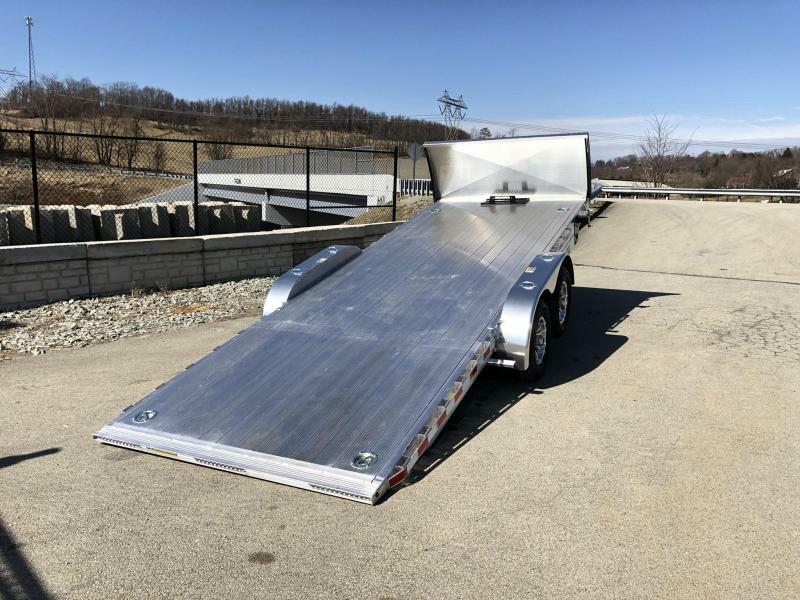 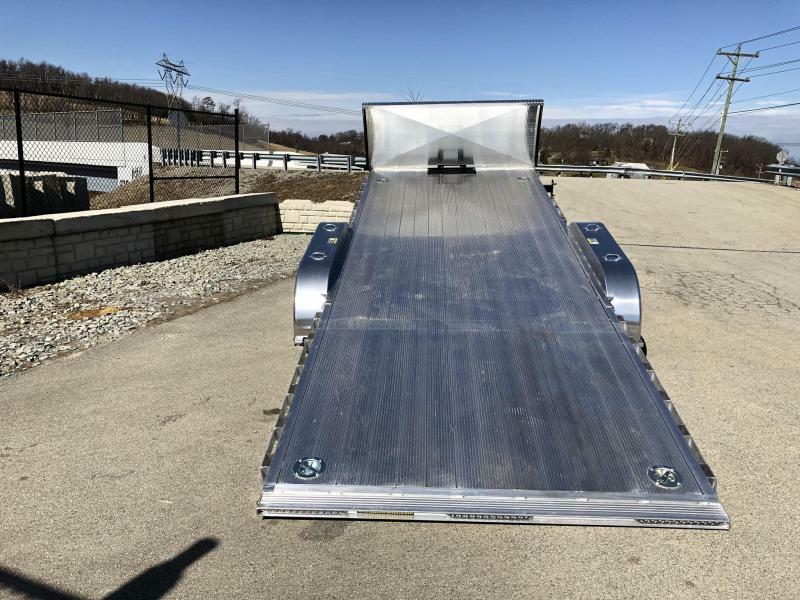 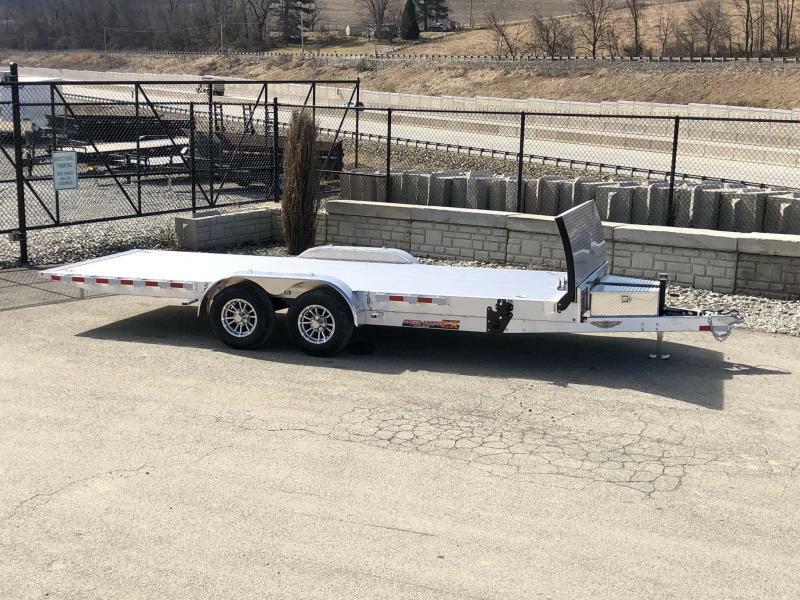 Aluminum Equipment (Tilt Deck) - If you are tired of ramps, don't want a beavertail to get hung up on, have the occasional need to overhang, or prefer full width loading rather than narrow ramps, this tilt deck might be for you! 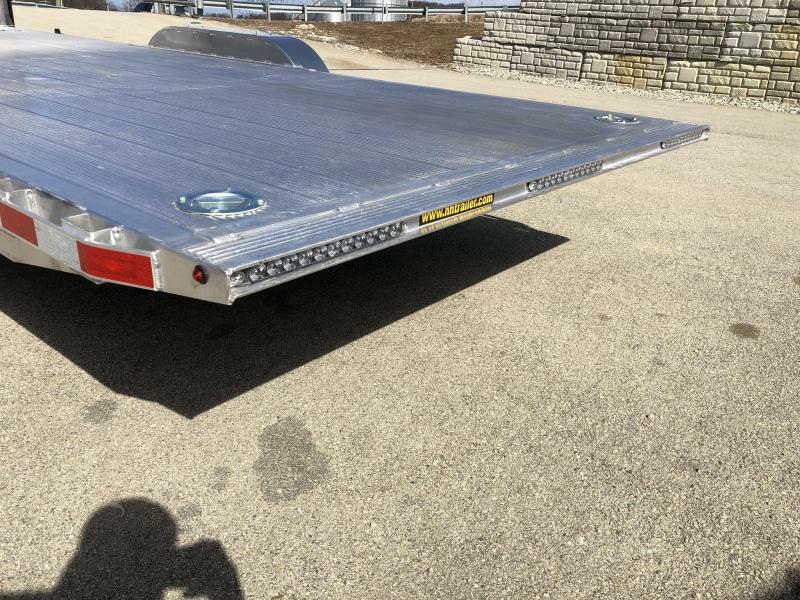 It is available in both a manual and power tilt, and a 7000#, 9900#, and 14000#. 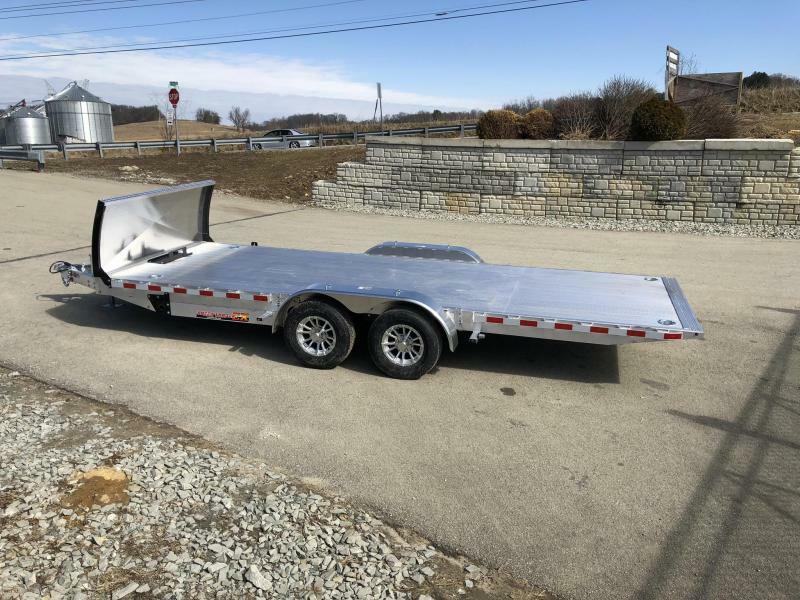 The chassis is very similar to the flatbed car hauler model as it shares the same tongue/mainframe, and a fair amount of similar features. 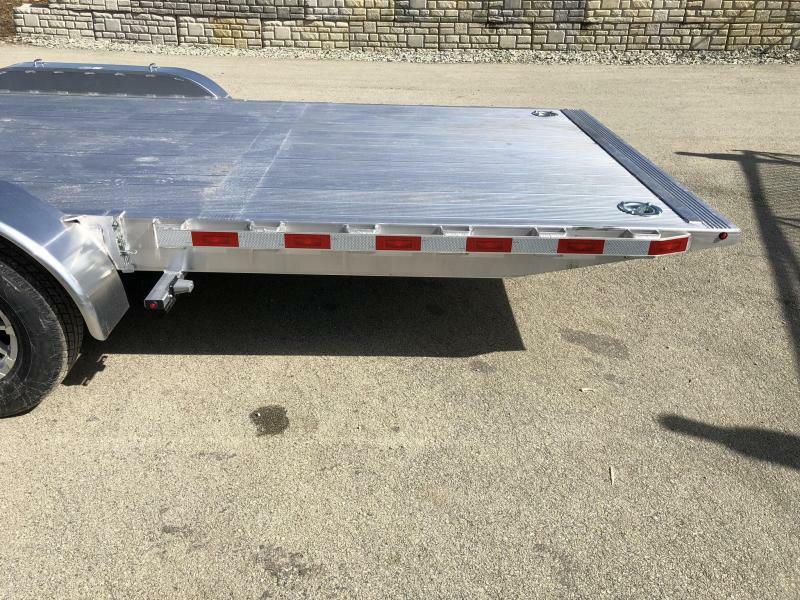 The trailer is equipped with a rubrail and stake pockets giving a virtually an unlimited number of tie-down locations. 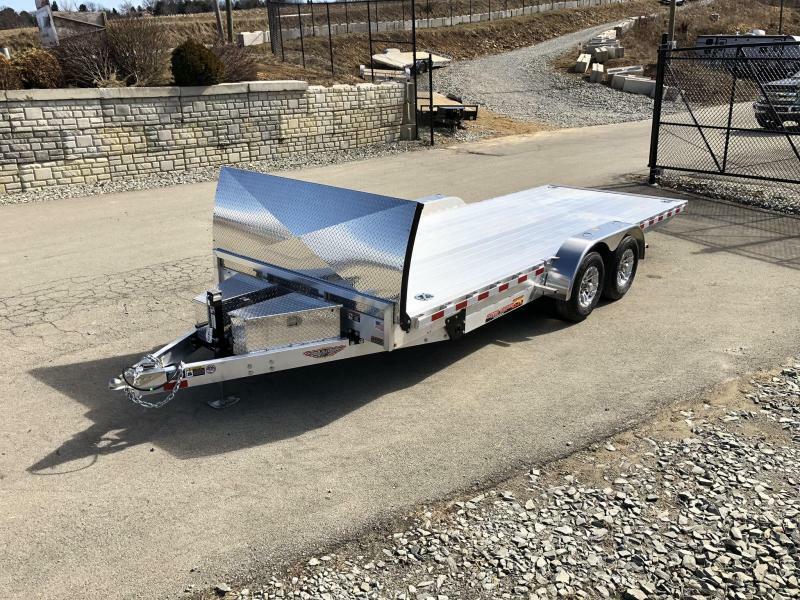 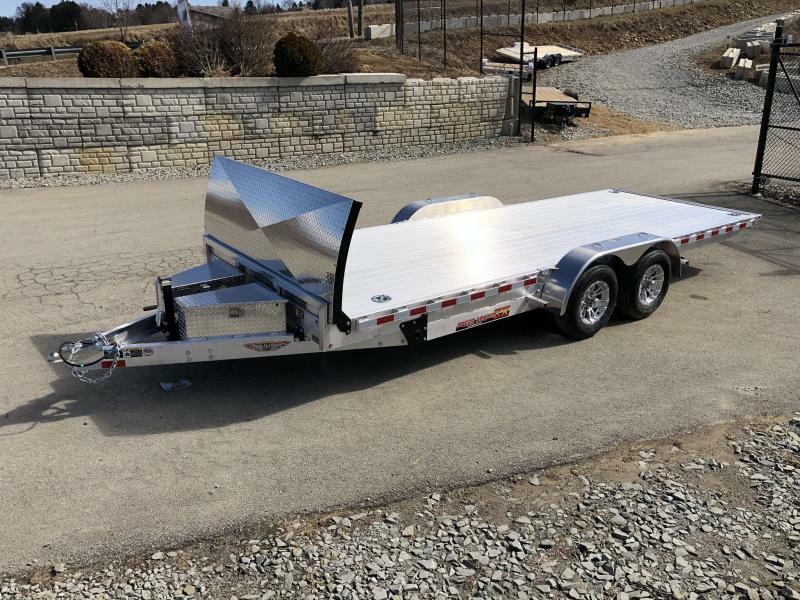 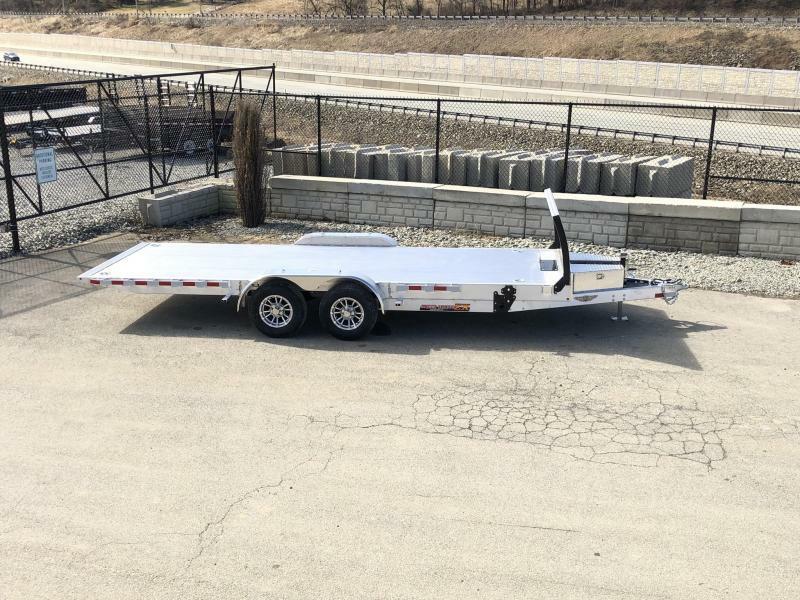 The 6" channel full wrap tongue and 8" channel mainframe make this a fairly rugged 9990# aluminum trailer - it surely won't win any awards for being lightweight. 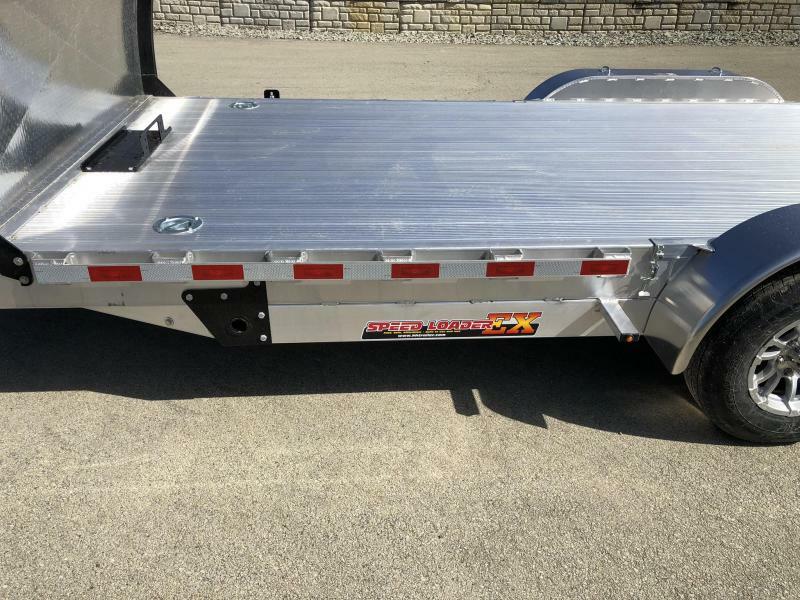 We also like the way the slimline lights and standard aluminum wheels, which give the trailer a tidy, sleek look. 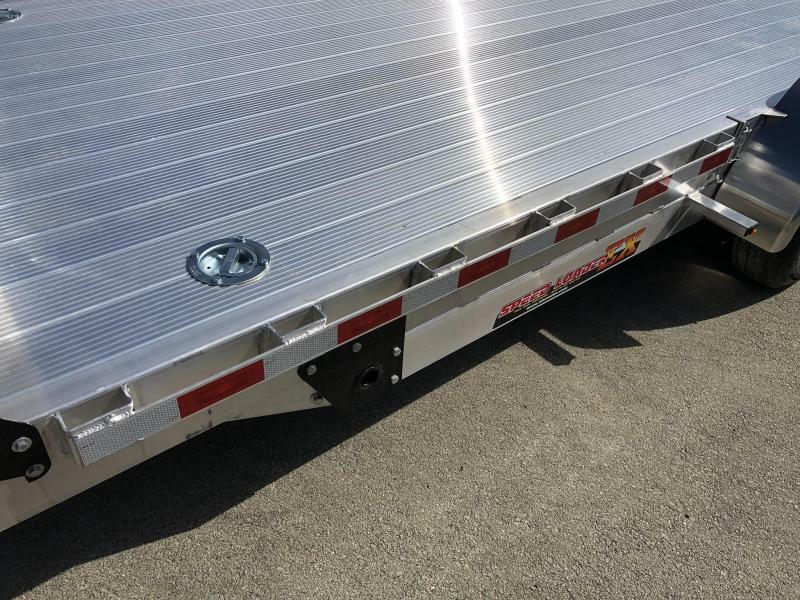 The removable fenders are well engineered for a quick and easy, yet secure deployment. 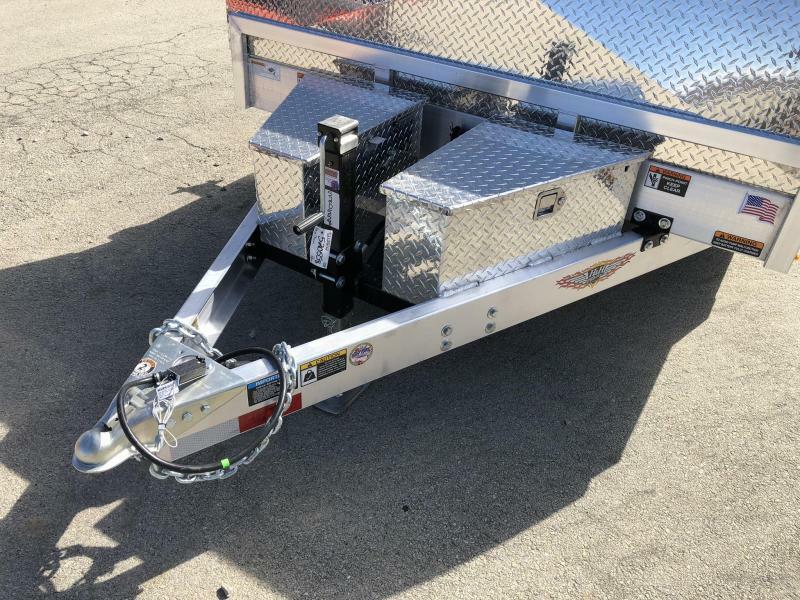 H&H uses a 7000# drop leg jack standard, and uses the newer style bullet LED lights. 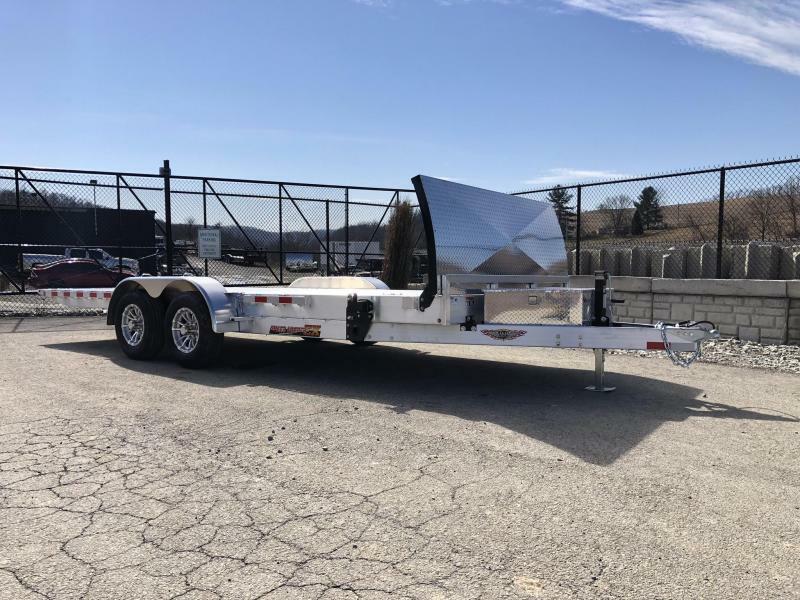 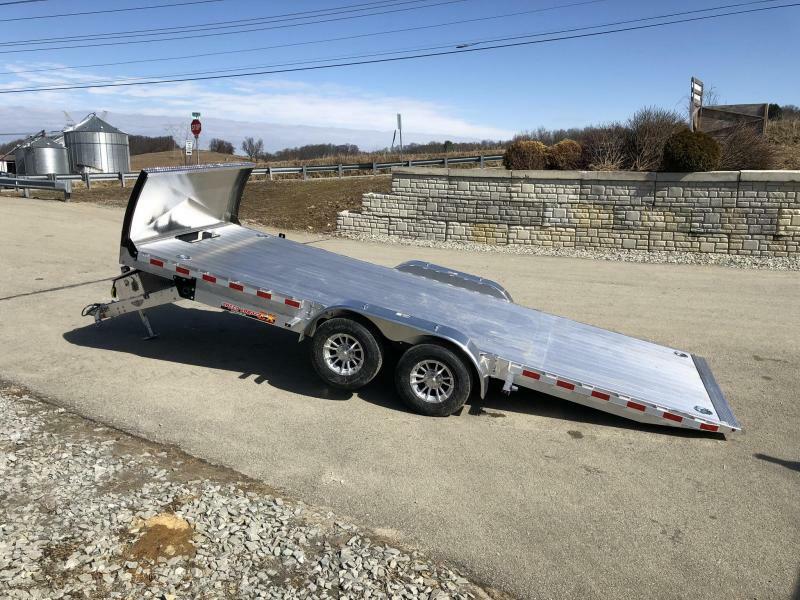 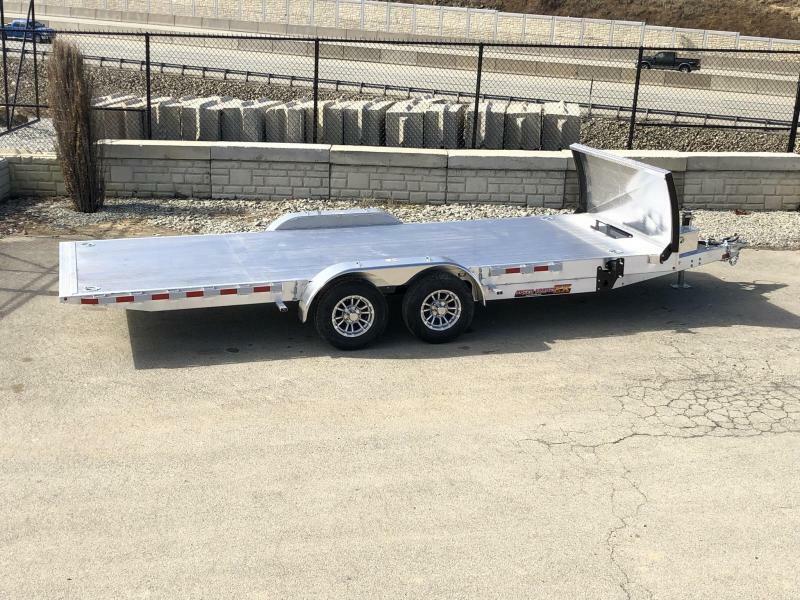 All in all, you're getting a tilt trailer for nearly the price of a regular aluminum car hauler making it a solid value in this segment. 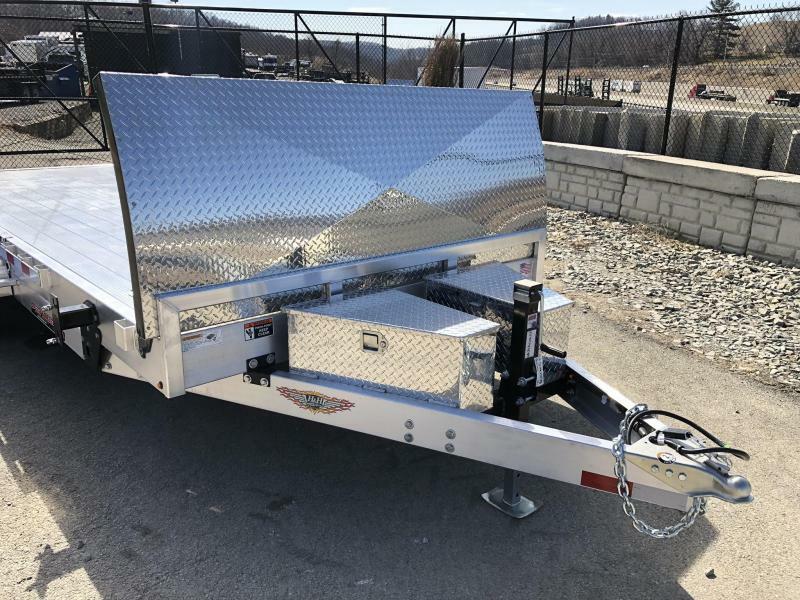 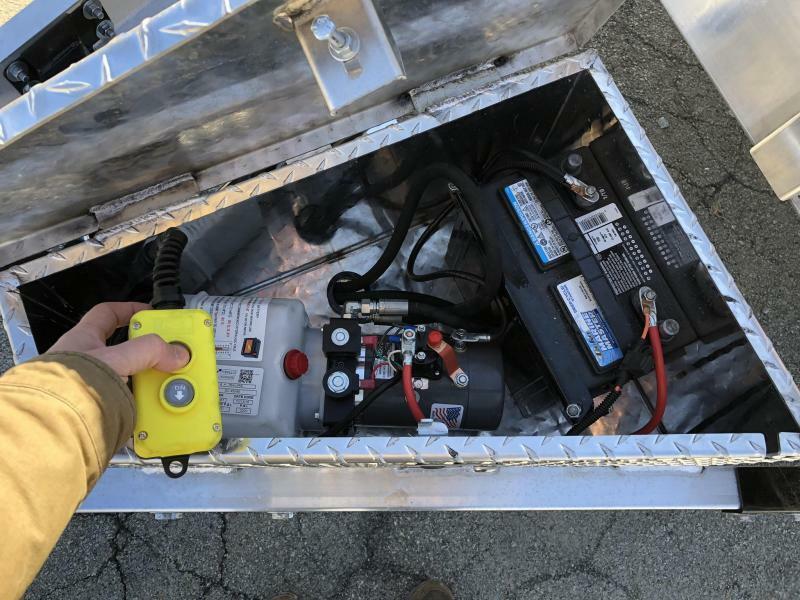 Some of the more common options for this trailer include a spare tire and mount, the power tilt option, front toolbox, extruded floor, drop axles, and a wireless remote. 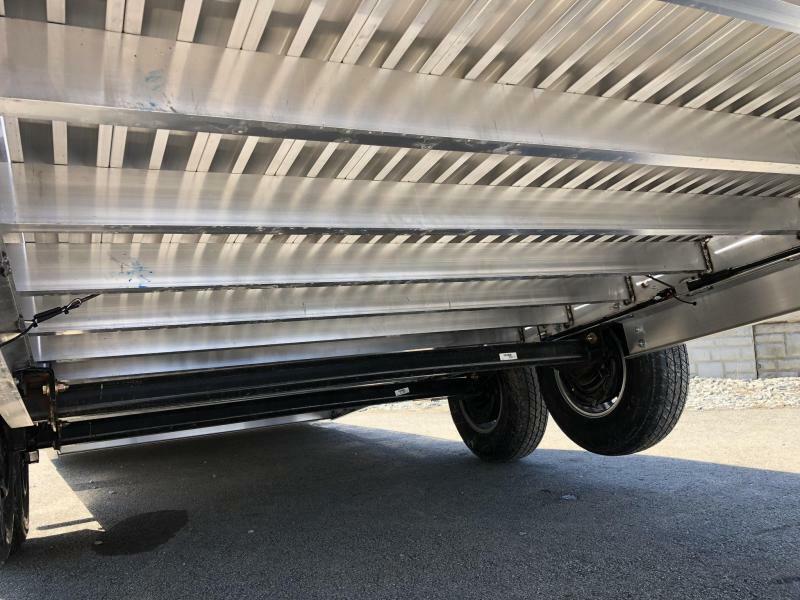 The 7x18 9990# model weighs in about 1960#, leaving a net legal payload of approximately 8000# + tongue weight (tongue weight is approx 10-15%, or 1000# if loaded correctly). 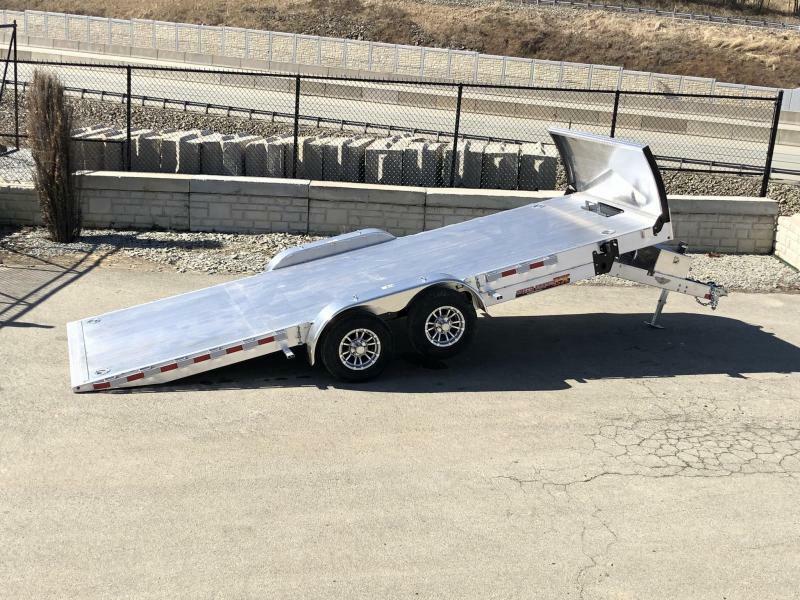 The ideal tow vehicle would be a AAAAAAÂ½ ton truck, but could also be pulled by a handful of other vehicles. 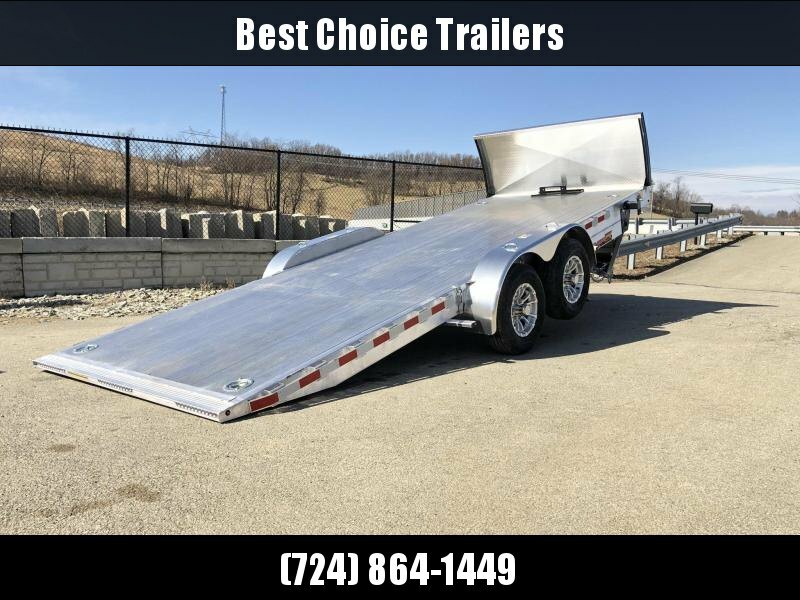 A trailer like this would make an excellent all around trailer for a homeowner or small business looking to haul items like a car or truck, compact tractor, and even light equipment. 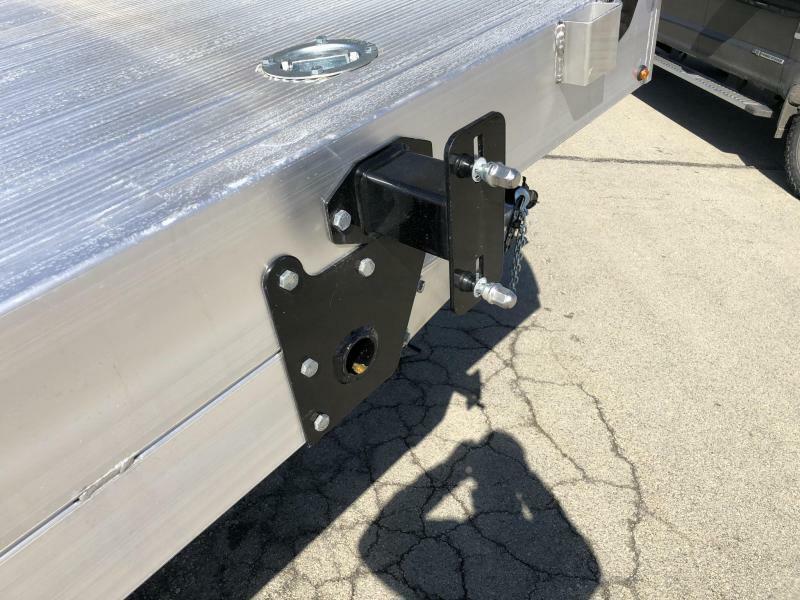 2 5/16" adjustable height, Posi-lock coupler with dual safety chains. 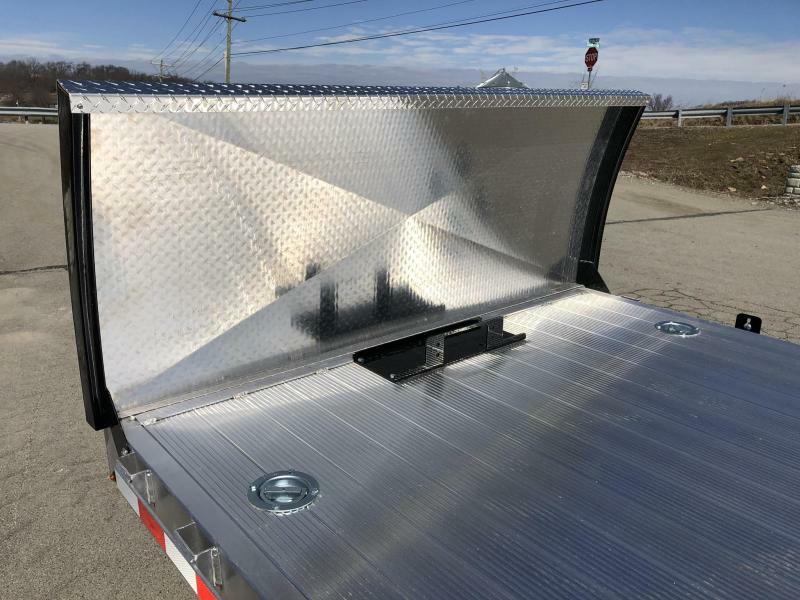 Reverse Dovetail (taper cut under the deck for lower approach angle than ramps). 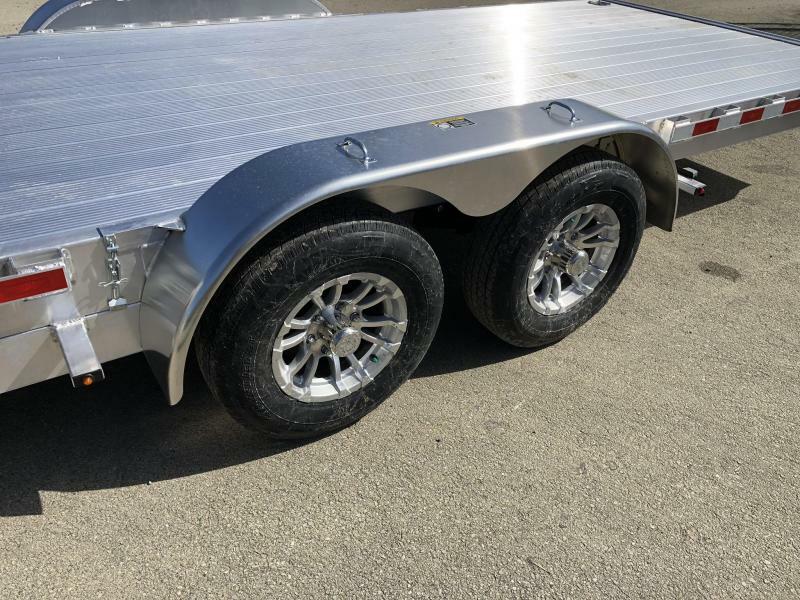 ST205/75R15 radial tires on 15" aluminum mod wheels. 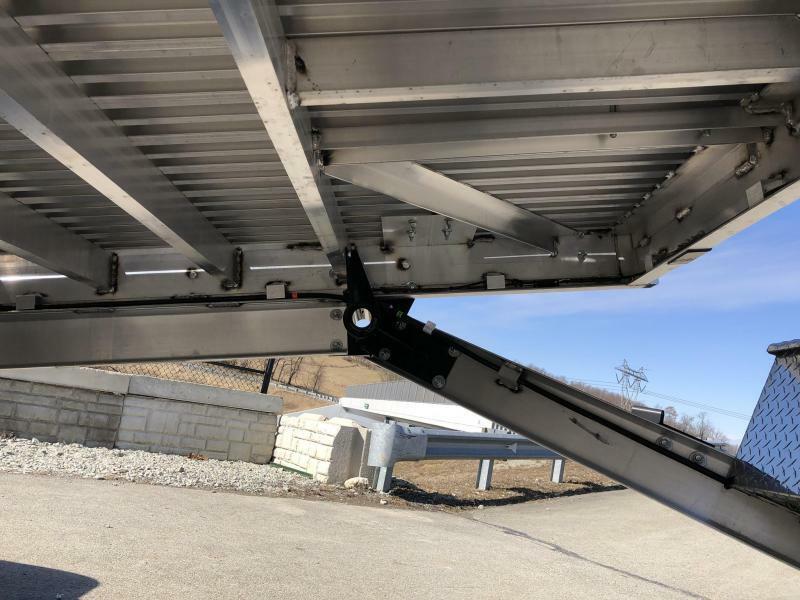 All steel bracing and attaching parts feature a durable powder coat finish for electrolysis resistance.